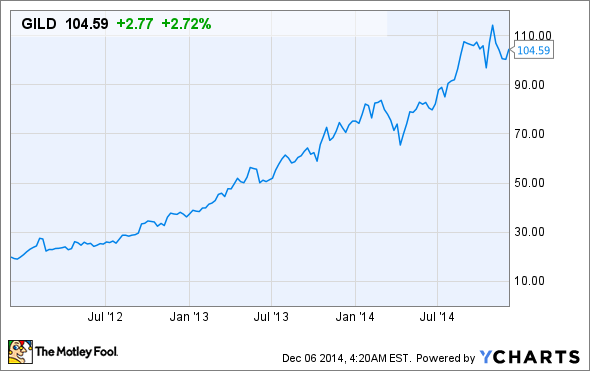 Which Biotech Will Become the Next Gilead Sciences, Inc.? Gilead Sciences' growth has been phenomenal over the past few years thanks to its hepatitis C and HIV infectious disease drugs. Find out which biotech could step into Gilead's high-growth shoes. When it comes to investing in the biotech sector, perhaps no company has been a better poster child for success than Gilead Sciences (NASDAQ:GILD). Over the trailing three years Gilead shares have rocketed higher by better than 400% as existing therapies and newly introduced drugs have sent sales through the roof. Perhaps nothing has been more critical for Gilead than its hepatitis C drugs Sovaldi and Harvoni. Both can be administered without interferon, and Harvoni, a cocktail of Sovaldi and ledipasvir, can also be administered without ribavirin. Since interferon and ribavirin are both laden with side effects, HCV patients have bid it goodbye with a smile. Beyond just a leap forward in patient care, Gilead's HCV duo has delivered sustained virologic responses -- essentially undetectable levels of disease in a patient -- of 90% or greater in nearly all clinical studies. In other words, HCV is finally being cured. Combined, these drugs are forecasted to bring in $10 billion-plus per year for Gilead throughout the remainder of the decade and perhaps beyond. Investors who stuck with Gilead were greatly rewarded. But for the rest of us who weren't riding Gilead's stock higher from the get-go, all we can think of is what biotechnology company will become the next Gilead. In order to reach the same level as Gilead Sciences, an up-and-coming biotech would need to address a global and chronic disease or condition. While pricey therapies developed by BioMarin Pharmaceutical, for instance, can help patients with ultra-rare disorders, a company focused solely on rare diseases is unlikely to experience a Gilead-like boom. Instead, I'd opine that the next Gilead Sciences could spring from one of the following two indications. I have trouble thinking of a bigger opportunity for big pharma in the United States than treating Alzheimer's disease. Right now roughly 5 million people aged 65 and up have Alzheimer's, with the Alzheimer's Association forecasting a 176% increase to nearly 14 million people being diagnosed with Alzheimer's by 2050. What makes this disease so particularly scary is that there aren't any medications strictly designed to prevent it, nor are researchers completely clear what causes Alzheimer's to trigger in some people but not others. Additonally, the blood-brain barrier is a tough code to crack, and has caused a number of late-stage compounds to fail within the past couple of years. One company that may have an edge up here is Biogen Idec (NASDAQ:BIIB), which announced last week that it was advancing Alzheimer's drug BIIB037 directly from phase 1 to phase 3 studies after it delivered encouraging results after 54 weeks in patients exhibiting early signs of the disease. BIIB037 is designed to remove beta amyloid -- the compound involved in plaque formation, which leads eventually to cognitive decline -- from the brain. Biogen Idec is set to release more detailed data on the 200-some patients in its phase 1 study sometime next year. I know what you're thinking: How can Biogen Idec be the next Gilead if it's already an $80 billion company? The answer to that question is that any Alzheimer's drug that can deliver on its promise to slow the progression of Alzheimer's could be huge! Peak sales for BIIB037 could reach as much as $10 billion worldwide. An additional $10 billion in sales (which, keep in mind, is just my guess) would double Biogen's current revenue (which has been soaring thanks to multiple sclerosis drug Tecfidera), and could pump its EPS to $25-$30. In short, if BIIB037 is everything Wall Street and Alzheimer's patients hope for, then Biogen's stock could soar. If you thought hepatitis C was pervasive, with the World Health Organization estimating some 180 million cases of the disease worldwide, then hepatitis B's 350 million global cases might really shock you. Hepatitis B prevalent map. Source: Centers for Disease Control and Prevention. Unlike hepatitis C, a fairly successful hepatitis B prevention treatment has been in existence for quite some time -- but with an efficacy rate of less than 100%, drug developers are always looking for ways to improve the treatment process and quality of care for existing HBV patients. At the moment, there are a few notable names developing hepatitis B compounds, including Arrowhead Research (NASDAQ:ARWR), which is developing RNA-interference candidate ARC-520. Although interim phase 2a data failed to impress Wall Street, the company is testing its drug at higher doses in the hope of seeing better efficacy. We should know a lot more about ARC-520 in 2015, but for now, results are not promising. Now here's the kicker about hepatitis B. The other major compounds to watch come from -- drumroll please -- Gilead Sciences. That's right; I'm suggesting that Gilead Sciences might be the next Gilead Sciences, and that its ascent may be nowhere near complete. The company has three HBV compounds in its pipeline at the moment, and the one with the most Wall Street attention, GS-9620, is expected to have results in the latter half of 2015. With the exception of Biogen Idec, there may not be another Gilead out there... except for Gilead itself, which could still benefit from improving HCV sales, as well as growth in Stribild, its four-in-one HIV drug.